On Saturday, I attended WISH 2010 in Tokyo (where I live) to see a total of 15 Japanese startups presenting their services onstage to a panel of judges and an audience of 550 people. 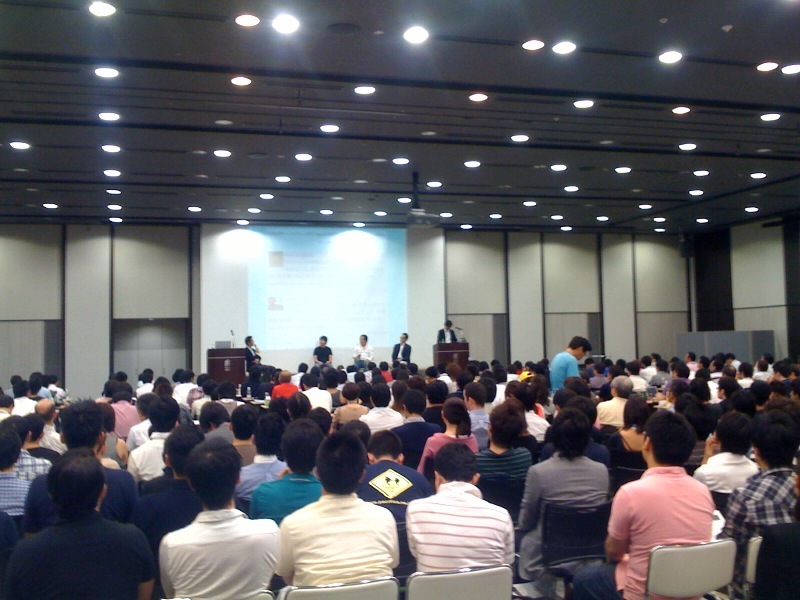 The event was organized by online marketing company Agile Media Network (“Japan’s Federated Media“). Puboo is a free e-book publishing service provided by major Japanese book review community Booklog (which currently counts more than 300,000 members). Launched in late June, Puboo has so far allowed individuals to publish 3,000 books (one example) through its interface. The books can be published on Booklog, as PDFs, or in EPUB format (and can be read on the iPad or the Kindle as well). Conyac is a social translation service that requires “requesters” to pay a certain fee upfront, upload a text (or image of a text) and indicate which languages the text should be translated into. Registered translators accept texts they think they can handle to earn “Conyac points”, a virtual currency. Those points can then be converted into real money via Paypal, with the service itself getting a 20% cut. Prices start at $0.3 per letter. Cacoo is a free online drawing tool that allows multiple users to create diagrams and other graphics (wireframes, software design diagrams, network diagrams, UMLs etc.) collaboratively and in real-time. We covered the entirely browser-based tool (which now boasts 55,000 users worldwide) in more detail here. Orihime is an online shop set up by a female college student who sells self-designed and made-in-Japan PC bags and accessories on the site. The shop encourages buyers to take part in the design and production process by leaving comments and wishes for future products on the site. Calil is a vertical search engine that lets users find books in over 5,000 public, university and special interest libraries in Japan. The service also provides rankings of the most popular books in those libraries, shows them facilities in their vicinity, lets users create lists of books they plan to borrow and alerts them once they become available. Garapon TV is a video recording service that lets users record and store TV programs in the cloud (“on all channels, 7 days a week”). All recorded programs can be watched anytime later on Internet-enabled devices, including the iPhone, iPad or Android phones (3GS demo video). Programs can be tagged, searched and recommended to other Garapon users. Launched a year ago, Twitter-based content aggregation and communication platform Togetter currently boasts over one million unique visitors and nearly five million page views per month, according to creator Yoshida. Togetter lets users submit comments to a certain topic through tweets, pulls relevant tweets into a dedicated page on Togetter and sorts them in a thread. On the page, users can further discuss the topic, contribute tags or add the page to their favorites or bookmarks (example page for a discussion thread on WISH 2010). Hardware startup Cerevo is best known for its social camera Cerevo CAM live!, the world’s first digital camera with Ustream live streaming capability (currently sold in Japan only). AT WISH 2010, the company introduced the Cerevo Ustream Box, a small battery-powered and Wi-Fi-enabled device that makes any camera Ustream-compatible (without using a PC). 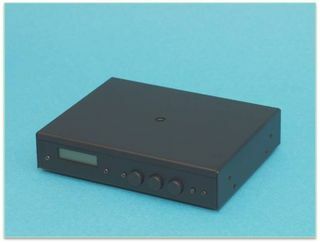 The box (pictured below) will go on sale in Japan this fall. Launched by Tokyo-based Exchange Corporation in December last year, AQUSH is a peer-to-peer lending service that is similar to ZOPA in the UK. Lenders set their desired investment amount and interest rates from 4% to 15% for 5 classes of borrower credit risk, as denoted by AQUSH itself. AQUSH loan applicants are screened based on their credit histories, financial situation and FICO scores. Loctouch is a Foursquare-like LBS application that’s available for the iPhone and Japanese feature phones. Launched by major web portal Livedoor six week ago, Loctouch lets users “touch” spots to indicate their location, recommend interesting places to others and earn badges over time (called “stickers”). Here‘s the web view of a burger restaurant someone “touched” in Tokyo. Tabereko for the iPhone aggregates information from printed Japanese “gourmet magazines”. Thanks to Google Maps integration, users can not only access the digitized contents but also find stores in their vicinity. Tabereko itself is free but monetizes via in-app purchases. Lifepalette is a health-oriented social network. The idea is to help users connect with others through writing diaries on the site, sharing news, asking and answering questions etc. (here‘s an example for a typical diary entry). Twitnovels is a Twitter-based community for “crowdsourced” novels that launched last month. Users can begin writing a novel and let others continue the story line from any point to create group-edited works (here‘s an example of a Japanese novel in the making by 14 different authors). More information on Twitnovels can be found here. Decomoji is a Japanese “web font service” for FireFox, IE, Safari, and Chrome. Web site owners can choose between 250 CSS3 fonts for a monthly fee (there’s also a free trial version). Launched last month, Twitter analysis tool TwiTraq currently boasts 27,000 users. Twitraq can be used for “self-analysis” (i.e. how often did I tweet in the last days, which hash tags and keywords do I and my followers use most often, etc. ), visualizing data in a number of ways (all data can be downloaded as CSV files). The free tool also provides insight about other TwiTraq users, for example by breaking down when, by whom and where tweets about a certain keyword were posted (this page shows the results for keyword “golf”). From the 15 participating companies, ten were pre-selected, while five (TwiTraq, Conyac, Twitnovels, Tabereko, and Togetter) were voted in by users. For completeness, click here for a list (in English) of the 27 startups that didn’t make the cut.